My Bikes (part 3) – and then I’ll move on! My newest bike is now 35 years old! But it has gone through a couple of restorations (perhaps I should too!). I have done several cycle trips to Belgium and one to Brittany – purely self-indulgent, especially when factoring in the delicious Belgian beers! However, my biggest trip was in 2010 when I cycled from Paris to Santiago de Compostela, following the pilgrim route. It was a great trip and whilst I broke no records (averaged 50 miles per day), it gave me plenty of time to contemplate life, the universe and everything. What was marvellous was the tremendous sense of camaraderie experienced at the pilgrim hostels in Spain, sharing cheap simple meals and bunkhouse accommodation along the way. 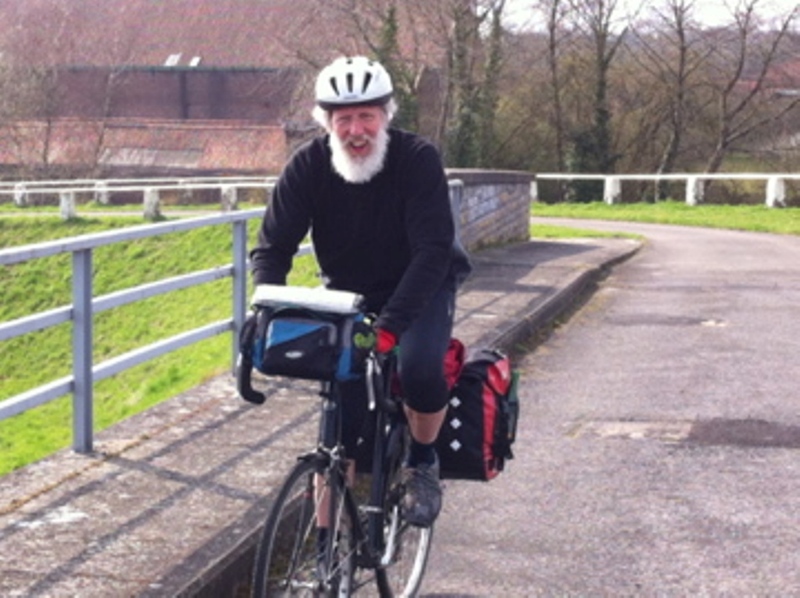 In a sense, this cycle ride to Paris is also a pilgrimage – this time to try to save the planet rather than my soul! Or at least show solidarity with those who are committed to real change for the sake of all, people and planet. Today (Friday 13 November) Luci Isaacson of Climate Vision and I were interviewed by Donna Birrell at BBC Radio Cornwall in Truro. Luci talked about the Climate Vision Report which we will be taking to Paris and I said why we were taking it there. For those early birds out there, you can hear the interview on Donna’s Sunday morning broadcast at 7.30am – the rest of you can catch it later on BBC Iplayer! Luci had also had a meeting with Sarah Newton, MP for Falmouth & Truro, and she has promised to pass on a copy to Amber Rudd, MP, Environment & Climate Change Minister, and also to table it at Cabinet Meeting! First, why am I cycling from Plymouth to Paris? One answer is that I was at the SW Green Party General Meeting in Plymouth on 17 September, when Roger stood up and announced “Ricky, Ewan and I are pedalling to the Paris COP21 Climate Conference“. Oliver, my local Somerset colleague, and I looked at each other quizzically – had Roger just volunteered me for a cycle ride to Paris? In November? Turns out there was a different Euan, who mis-spells his name with a “u”. But, I like cycle touring, and secondly, doing whatever I can to help us take common responsibility for climate stewardship has been a personal passion since before my University days. The first Intergovernmental Panel on Climate Change (IPCC) report was published in 1990, my first year of studying undergraduate physics. That same year Jeremy Leggett, former Big Oil geologist, authored Global Warming: The Greenpeace Report. … Around the same time, I had a wonderful and beloved bike stolen from an underground bike locker. Raleigh Competition, beautiful black, with elaborate gold butting. My Uncle, who worked for Raleigh in Nottingham, had sourced it for me. From the parts bin, he built this new lightweight 531. He rode the London to Brighton with her, and I simply added some wider swept Italian handlebars. We have travelled together to the Scottish Highlands three times, on the sleeper from Euston to Fort William. Over to the the Golden Road on Harris, and Calanais on Lewis once. Altnaharra (the coldest place in Britain) once. Assynt and Suilven twice. In 2003, we climbed Bealach-na-Ba (admittedly only with a day pannier). We kept forward momentum all of the the way up the stream bed to the hairpin. The descent into Applecross was the best ride ever – well sighted single-track Scottish road, fuelled by uphill Scottish endorphins. They are natural, and they work! Along with all people of goodwill, we are shocked and saddened by the horrific events which took place in Paris on Friday night. First of all, we are still going to Paris, despite the events of Friday night, as you will have read from the announcement from Climate Vision. And apologies to those of you who might have tuned into Radio Cornwall expecting to hear Luci and me being interviewed by Donna Birrell – again, the events in Paris overtook us all. On the eve of our departure, my bags are packed, and I am listening to the wind and rain blowing around outside. Hopefully, it will blow through tonight and our departure will not be too wind-blasted! Anyway, I am looking forward to getting under way and to meeting our various well-wishers as we head for Plymouth. I think the Cornish leg of the journey will be the more challenging with all those hills; from St Malo to Paris is less hilly but further, but we have factored in enough time to allow for possible delays. Just had an email from Helena from Truro who is in India at the moment and she tells me that the children at the school she is at are all switched onto the Climate Change situation. Good to be able to share with them in this pilgrimage of hope! Next update – once we are on the journey! so day three dawns nice and mizzly as Cornish November days should. Waste a lot of time uploading pics which takes ages so just time to bung them all in a gallery on here before time to leave for Looe. Its a lovely ride down the Looe valley – in summertime – but not all downhill by any means. The lane between St.Keyne and Sandplace is proof of Cornwall Council’s stated policy (at a recent planning forum) of “managed decline” of the road network. Rutted, pohtholed,muddy, leaf litter,twigs and small branches strewn over the surface. However the council have introduced a splendid new bit of cycle infrastructure – the built-in bike wash! A photo will follow, but basically it consists of a 2 foot deep lake the whole width of the lane at the top of the worst bit so that your wheels, chain, chainset,gears and feet get a thorough wash. There will eventually be a photo to illustrate this but on the lane between Tideford and Lantallack there is a genuine 1 in 4 steep hill road sign. None of your 25% namby pamby rubbish. Four step forward, on step up. Euan and I tested it and can vouch for the fact that it is certainly not rideable – especially with Euan’s “man gears” (52-42 front and 12-24 rear with an extra 32tooth granny ring – I haven’t had gears like that since I was well the other side of 40), but my 28 front 34 rear lowest gear wouldn’t hack it. Still we had a nice chat with Laurence Reed on Radio Cornwall at the top.